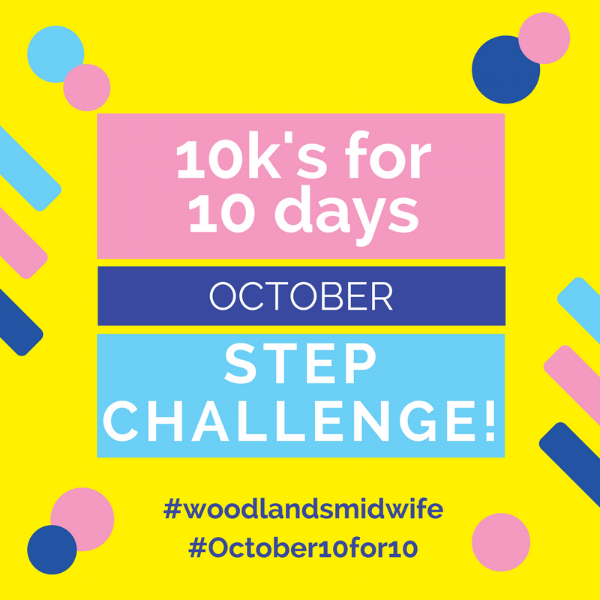 Lisa Rutledge | Woodlands Midwife - 10k's for 10 Days October CHALLENGE! Using your smartphone, Fitbit, etc., log 10,000 steps for 10 days in October (doesn’t have to be consecutive). Like Lisa Rutledge, LM, CPM on Facebook. Set the following as your status and tag @WoodlandsMidwife or Lisa Rutledge, LM, CPM. Send your step count data to OctoberStepChallenge@gmail.com by midnight on October 31, 2017. Each eligible female to complete the challenge will be entered into the drawing to win a gift card to Zappos for a new pair of running shoes. Anyone can participate, but you must be a female in the Greater Houston area to win prizes.